Make sure that your Cream Dory is not frozen. The one we bought from the grocery is super frozen that’s why I had to remove it from the freezer last night. Cut the fillet into two. I did this because I think it is easier to cook it that way. Marinate the fillet in salt and pepper. I cannot tell you exactly how much pepper and salt to put. The first time I did this, I forgot this step. I ended up having a fish with semi-bland taste since there’s butter. This time around, I put too much salt. Probably on the third time, I’ll just have it right. Heat your frying pan in low-medium heat. This will help in melting your butter fast but prevents your garlic from being cooked too soon. I over-cooked the garlic this time before I placed the fish so by the time I put in the second batch, my garlic are already toasted. During my first try, the garlic are just golden brown, not like the one above. They tasted really good! This one tastes bitter. Put in your butter and just before everything is melted, put the garlic. When your garlic is semi-cooked, put the fish. When the fish no longer sticks to the pan, you can already flip it to cook the other side. You should notice that the first side you cooked is already light brown in color. Do this for all the fish. Hey! It's been a while, eh?! Does HTH means hope this helps? Ignorant me! Thanks for the tip. Bad kasi ako noh, ung binili kong non-stick pan nakatago! LOL. I've been actually thinking of buying MIL her own para di ko na ilalabas yung akin. BTW, I use a different cooking technique to avoid burning the garlic. I fry the fish on a non-stick skillet and then set them aside. Then I pour some cooking oil on a separate pan, throw in the garlic, and turn off the heat once the garlic goes a little brown. Then I add slices of butter. Once the butter melts, I pour the mixture into a small bowl. 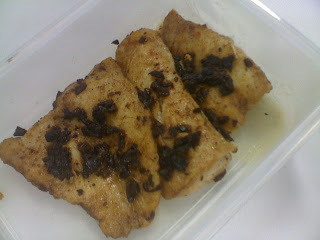 Then, using a teaspoon, I slather the cream dory fish with the garlic butter. Wow sis! Thanks for sharing the recipe. I want to try it too. Problem is, I don't know what Cream Dory is. I guess it's a type of fish. Haha! So ignorant of me. Can I easily find it in SM Grocery? Thanks!